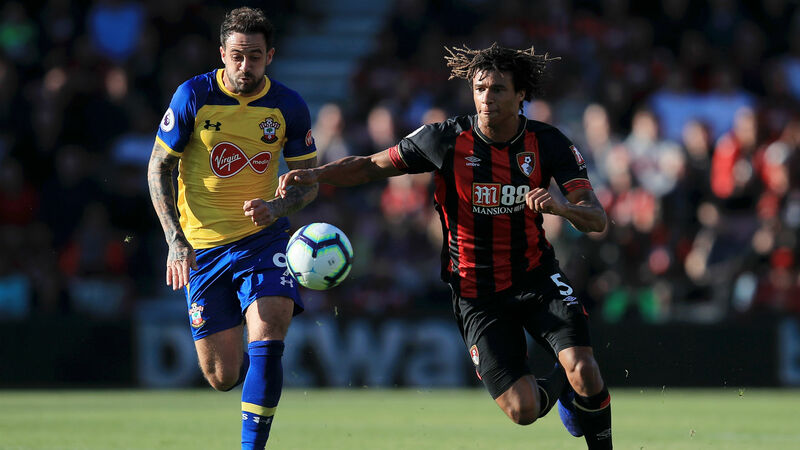 Bournemouth failed to make it three Premier League wins in a row as they were held to a dour 0-0 draw by Southampton at the Vitality Stadium on Saturday. Eddie Howe's side had beaten Crystal Palace and Watford before the international break to maintain their fine start to the season, but they were unable to find a way past the struggling Saints – who have still won just once this campaign. Mark Hughes' side had the better of a limp first half, but rarely tested Cherries goalkeeper Asmir Begovic, as Callum Wilson and Josh King cut isolated figures up front for the hosts. King squandered a fine opportunity to seal maximum points for his side, clipping wide from close range, as the hosts' superb start to the season suffered a minor setback. After a tepid opening half-hour, Charlie Austin wasted a clear opportunity for the visitors. Instead of shooting, the striker opted to take a touch around the onrushing Begovic, but only succeeded in rolling the ball out of play. Pierre-Emile Hojbjerg then tested Begovic with the game's first shot on target on the stroke of half-time, unleashing a dipping long-range volley that was well held by the goalkeeper. Howe's men started the second half with a spring in their step, King flashing a header wide from Jefferson Lerma's teasing cross, but they failed to force Alex McCarthy into a meaningful save. King then missed a golden chance just after the hour, scuffing wide from eight yards from Wilson's pull back, while Begovic again had to be alert to tip over another long-range volley from Hojbjerg. Shane Long fired at Begovic late on and Manolo Gabbiadini headed over deep into stoppage time as Southampton ultimately failed to produce a dramatic finale to a game desperately lacking in quality. The two-week international break has clearly blunted the Cherries' sharpness. King and Wilson were unplayable against Palace and Watford, but rarely threatened the Saints' backline as Howe's side failed to build on their stunning start to the campaign. Southampton, meanwhile, end a run of three straight league defeats and, if anything, will be disappointed they did not claim all three points. In a game of few chances, it was Southampton's Danish midfielder who looked most likely to break the deadlock. The 23-year-old has a fierce strike on him and twice tested Begovic from distance in what was an impressive display. Hughes opted for Danny Ings and Austin in attack and it is hardly surprising given Gabbiadini's lack of confidence. The Italian showed why he has yet to score this season, heading over from a promising position late on after Begovic had flapped at a cross. - Bournemouth have lost just one of their last nine home Premier League games (W5 D3) and are unbeaten in their last six at the Vitality Stadium (W4 D2). - Southampton have failed to score in four consecutive Premier League games for the first time since October 2004. - The Saints have won just two of their 10 Premier League away games under Mark Hughes (D3 L5). Howe takes his side to Fulham next Saturday, while Southampton host fellow strugglers Newcastle United at St Mary's on the same day.